Certain polishes trigger polar opposite feelings in me, and I'm not sure why. 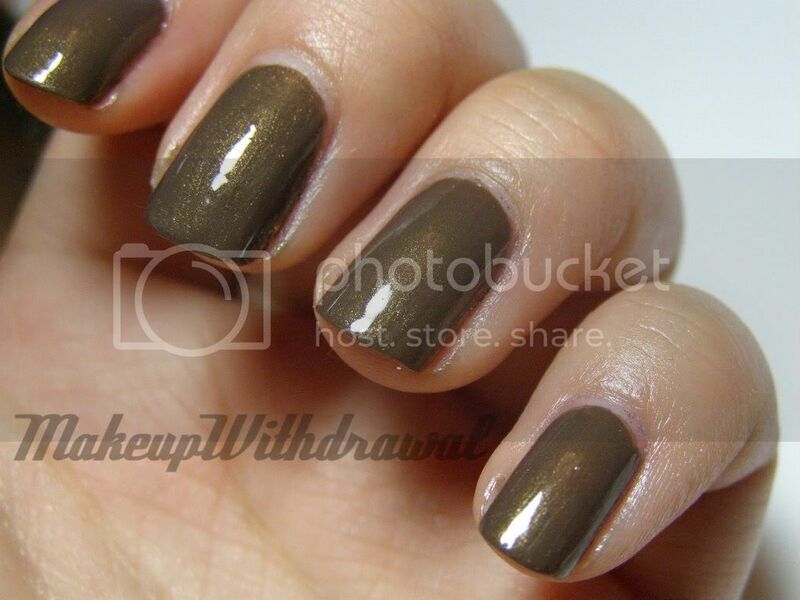 Usually it's murky colors with some sort of subtle glimmer like say for instance, Chanel Paradoxal. I can't figure out if I really love or hate these colors, or both at the same time. China Glaze Ingrid is also on this list. I can't decide it's the most sophisticated, understated color I've ever seen or if it looks like the shade of gilded poop. Really, doesn't it look kind of gross and mysterious at the same time? When I try to think about how this color ties into the Fall Vintage Vixen collection, I mentally envision a statuesque woman with her hair in a wavy updo with a soft mink coat wrapped around her. It's taupey goodness (I highly object to it being called 'greige' seeing how dark it is, it fits taupe much better) with a lovely fine shimmer to it. Anyways, I must say that I really enjoy the application of this polish. Super opaque, it glided on with absolutely no problem whatsoever, even though it's on the runnier side- this might actually be my favorite China Glaze application of all time. It only took two coats too, that's how nice this polish is. Again, I don't feel like this color is suited for the super hot weather lately, so I'm going to save this for when it cools down. I'm not sure what kind of clothes or makeup I'd pair this up with but being a neutral I bet it'd be pretty hard to go wrong! What do you think of this polish? Does it look like shimmery boogers or something you'd love to get your hands on? @Alvira TY! :D Hope you can get your hands on it! LOLLL. I love this on you but I totally know what you mean. I feel the same way about most of the taupe polishes that I've seen, though it's not always a gilded poop kind of thing LOL. But Essie Mink Muffs (which I actually own), Chanel Particuliere, etc - even the sparkly ones like $OPI Almost Famous and Under My Trench - I LOVE them on other people, just hate them on myself ... this is also why I own no cream polishes... lol. I really like this one! It kinda reminds me of MAC's Gazette Grey e/s in polish form.